In this area of the Apparel Search fashion brand directory, you will find Men's fashion brands from leading apparel companies and fashion designers. On this particular page, you will find information regarding Men's clothing with the Van Heusen brand. You are welcome to utilize this section of our clothing guide to review Van Heusen news, Van Heusen blog posts, Van Heusen photos, and more. Please understand that you may run into a few photos or a tad of information that does not actually pertain to the Men's Van Heusen fashion brand. Unfortunately, no search technology is absolutely perfect. We will continue to do our best to bring you as much information about the Men's Van Heusen fashion collection as possible. The brand is partly named after Dutch immigrant John Manning Van Heusen, who in 1910 invented a new process that fused cloth on a curve. The history of Phillips-Van Heusen (PVH) goes back in part to Dramin Jones, a Prussian immigrant who founded the shirt manufacturing company D. Jones & Sons c. 1857. Separately, in 1881, Moses Phillips and his wife Endel began sewing shirts by hand and selling them from pushcarts to local anthracite coal-miners in Pottsville, Pennsylvania. This grew into a shirt business in New York City. D. Jones & Sons merged with M. Phillips & Sons in 1907 under the name Phillips-Jones after Dramin Jones's death in 1903. Later Isaac Phillips met John Van Heusen, resulting both in their most popular line of shirts (Van Heusen), and in the subsequent acquisition of Van Heusen by Phillips-Jones and its renaming to Phillips-Van Heusen in 1957. In 2011, Phillips-Van Heusen is renamed to PVH. 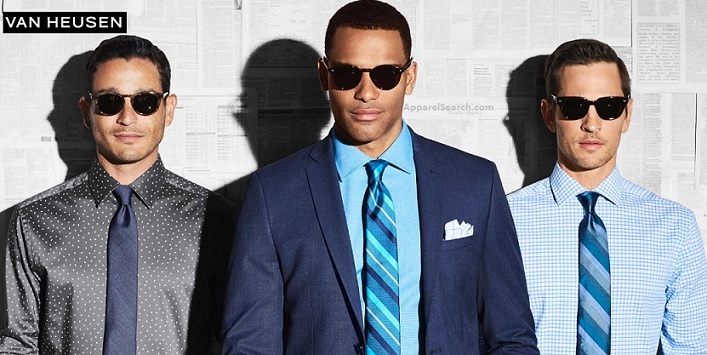 Learn more about the men's Van Heusen clothing brand. Van Heusen is a part of PVH Corporation. PVH Corp, formerly known as the Phillips-Van Heusen Corporation, is an American clothing company which owns brands such as Van Heusen and many other popular brand names. If you have changed your mind and do not wish to research the brand Van Heusen, you can use the search engine on this page to find another clothing label that may be of more interest. Apparel Search is a leading guide to fashion, style, clothing, glam and all things relevant to apparel. 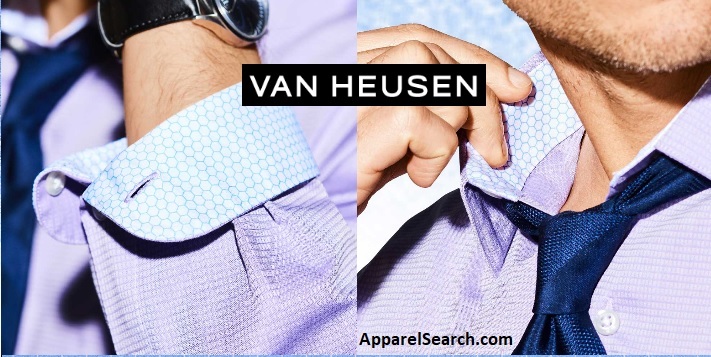 We hope that you find this Van Heusen page to be helpful.